Wondering about the cetane ratings of diesel fuel? With so many diesel passenger cars now in general use, it’s a topic of increasing interest. 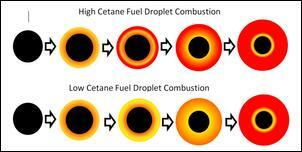 In order to make sense of cetane, we need to look at diesel combustion in a bit more detail. You probably already know that ignition occurs when the heat from compression ignites the fuel, instead of a spark plug. But there are some important details of this process you might not know about. Unlike most petrol engines, diesel is injected into the cylinder as small droplets near the end of the compression stroke. As anyone who has dropped a match into a pool of diesel will know, liquid diesel isn’t easy to ignite because it has to evaporate first. First, the injected droplets must absorb enough heat from the compressed air to evaporate some of the fuel from the surface. This evaporation requires heat, so the liquid droplet and miniature cloud of gas are cooled. Then, the gas must mix with enough air to form a combustible mixture. This will happen progressively and spontaneously, but requires time. Finally, as the temperature of the first bit of evaporated fuel reaches the point of spontaneous combustion, the fuel will start to burn. If the delay between evaporation and ignition is long, then there is more time for mixing with air to occur. Once ignition begins, any fuel already evaporated and mixed with air will burn very rapidly. In relative terms this burning will be practically instantaneous, explosive even, resulting in a sharp pressure rise which causes the classic diesel knock or rattle. In petrol engines, all of the fuel is present in the combustion chamber when ignition is started by the spark plug. In theory, it will all be evaporated and mixed with air in a combustible mixture. However, in diesel engines, fuel is injected at a fixed rate. Under light throttle, the injection pulse will be very short, while full throttle will require a longer injection period. The first fuel injected into the diesel cycle combustion chamber will need to be heated, first to evaporate it and then to raise it to ignition temperature as already described. Slightly later in the cycle, fuel will be injected into a mixture which is already burning, so heat and pressure will be produced at a steady rate. In order to minimise the ignition pressure spike, the amount of evaporated diesel present must be as small as possible. Ignition which takes place late in the cycle after much of the fuel has been injected and evaporated will explosively burn a large amount of fuel all at once. This reduces efficiency, causes high emissions and may damage the engine in much the same way as detonation in petrol engines. Therefore, the time between injection start and ignition should be as short as possible. 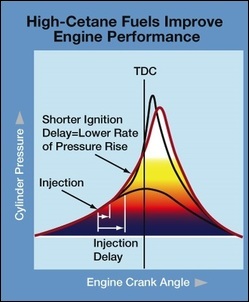 High cetane fuel has a much shorter delay between the start of injection and ignition. This means that ignition happens sooner, when very little fuel has been injected and even less has evaporated and mixed with air. Under ideal conditions, ignition will occur very shortly after injection begins and the explosive burning of fuel vapour will be limited, resulting in a quiet, efficient and longer living engine. It may help to consider that high octane petrol will resist auto-ignition, whereas a high cetane fuel will easily auto-ignite. The design of diesel engine combustion chambers and injectors is a complex process involving many parameters. One key objective is to design the diesel engine to run well on moderate to low cetane fuels. One early design feature, still used in many light industrial diesels, is a ‘Ricardo’ swirl combustion chamber. 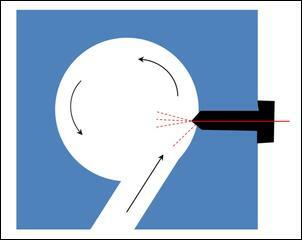 During compression, air is forced through an orifice into the separate combustion chamber at high speed. The fuel injector is located inside the combustion chamber, near to the outlet of the orifice. Most of the fuel is directed towards the centre of the chamber, but a small quantity is aimed directly into the oncoming air flow. As the droplets are heavier than air and moving at high speed relative to the incoming air, they are rapidly heated. This enhanced air to fuel heat transfer helps to rapidly initiate combustion, reduces the ignition delay period and lowers the explosive pressure spike. It also makes the engine easier to start from cold. Most modern car engines use electronic direct injection, rather than a separate combustion chamber. 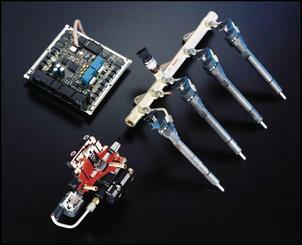 Electronic injection makes it possible to inject a small pulse of fuel early in the compression stroke. This fuel takes time to heat up, evaporate and ignite, but because there is only a small amount of fuel, the initial pressure spike is also very small. Later, when the main injection takes place, injected fuel encounters heat from already burning fuel and the delay before it starts burning as well is greatly reduced. The high efficiency, smooth running and high power to weight ratio possible with modern diesel engines is largely due to a combination of combustion chamber design, high pressure electronic injection and high cetane fuels. All of these help to reduce pressure spikes associated with ignition delay. This allows the use of lighter components and higher power outputs. 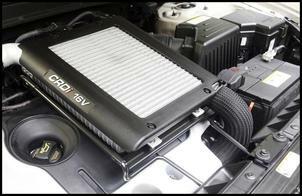 However, most diesel engines are not any stronger than they need to be. If you use fuels with an inadequate cetane rating, the added stresses on your engine may cause early failure, not to mention rough running, poor fuel economy and high emissions. As with octane ratings for petrol, cetane ratings are based on the performance characteristics of the chemical n-cetane. So a fuel made up of 100% n-cetane will, by definition, have a cetane rating of 100. Of course, real diesel fuels are complex mixtures of hydrocarbons. Cetane fuel ratings for these fuels are determined using a test engine in accordance with ASTM D613. The performance of a commercial diesel blend is then equated to the performance of the appropriate blend of n-cetane and alpha methyl napthalene. If the performance of a tested fuel is equal to that of a blend with 50% alpha methyl naphthalene and 50% n-cetane on the test engine, then the cetane rating will be 50. The ASTM D613 method requires specialist equipment, is time consuming, expensive and the results are not very precise. Therefore, in practice, while D613 remains the primary reference method, a range of other methods may be used. The method most closely related to D613 is the Ignition Quality Tester (ITQ). This method is essentially a static heated combustion chamber. A single charge of fuel is injected and the ignition delay period is measured. This gives much more reproducible results, but still requires skill and specialist equipment. A range of methods based on common laboratory instruments or physical properties have been tried with varying levels of success. ASTM D4737 uses API gravity (density) and various temperatures in the boiling range to estimate cetane performance. Cetane values for commercial blends of diesel tend to fall in the range between 35 and 55. Future improvements to the weight, cost and output of diesel engines may be possible through the use of fuels with even higher cetane values. Remember that can of starting fluid you used when it was really cold or you had an engine which wouldn’t start? The main component of this starting fluid was dimethyl ether. This chemical can be produced from methanol and when used neat has a cetane rating between 55 and 60, compared to standard diesel in Europe at 51 and US #1 diesel at 44/45 and #2 diesel at 40, and Australian diesel with a minimum of 46. Dimethyl ether has a high cetane rating because it evaporates easily and has a very low ignition temperature. Diesel engines of the future may be even more powerful than petrol engines and run on renewable fuels which are nothing like what we currently call ‘diesel’. So, use fuel with a high cetane rating and everyone’s happy, right? Well, not exactly. You see, large diesel engines such as those on tractors, lorries, trains or even ships tend to operate at lower speeds and are much more tolerant of low cetane fuels. 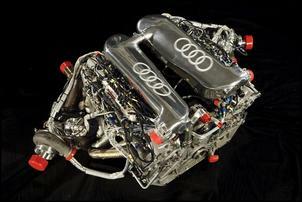 Their low speed allows the use of comparatively small injectors which inject fuel over a longer period of time. This slower injection rate also means that less fuel will be present to detonate at the end of the ignition delay period. The second reason why lorry fleet operators might be unhappy with high cetane fuels is that they tend to release less energy when burned. This means they have to buy and carry more fuel. Since high cetane fuels are also generally more expensive, you can see why they are not so attractive for engines where they are not needed. Extremely high cetane fuels in engines which don’t need them can cause mixing problems if the fuel ignites before it can be distributed throughout the combustion chamber. So, before you decide to start experimenting with alternative diesel fuels because they are cheaper, greener, waste materials or untaxed, consider their likely cetane rating against that recommended by the manufacturer of your engine. Also, remember that there are other important qualities to look for in diesel. Things like lubricating ability (for some older pumps), and the presence of water and dirt, are equally important. Developing an aero undertray for a Toyota Prius!